Website Design for Sign Companies | Here is another outstanding website design by VISIONEFX. We build SEO ready websites. Search Engine Optimization strategy be part of the overall design strategy with careful consideration of H-tags, bolded copy and links with respect to the website meta-data. While other web companies throw out sales jargon and charts filled with online hits, visits and referrals – none of this has any bearing on your business unless you are getting emails or phone calls from interested customers. This recent web design Chesapeake project for Designs Inc. provides a competitive branded website presence in a highly competitive space. Click the ‘View Our Design Process‘ link below and browse the creative concepts we develop before building you that perfect website design that is tailored to your business brand. Call VISONEFX at (757) 619-6456 or email direct to info@visionefx.net. VISIONEFX has great Google Reviews from verified customers posted on ‘Google My Business pages’. We invite you to read our reviews and contact our website customers. They will tell you our web design and web maintenance services are second to none. For more information about website design, search engine optimization, website maintenance call 757-963-1787 or contact here. We also invite you to read our client reviews. Feel free to reach our and contact our website customers. They will tell you our web site design and lightning fast web site maintenance services are second to none. 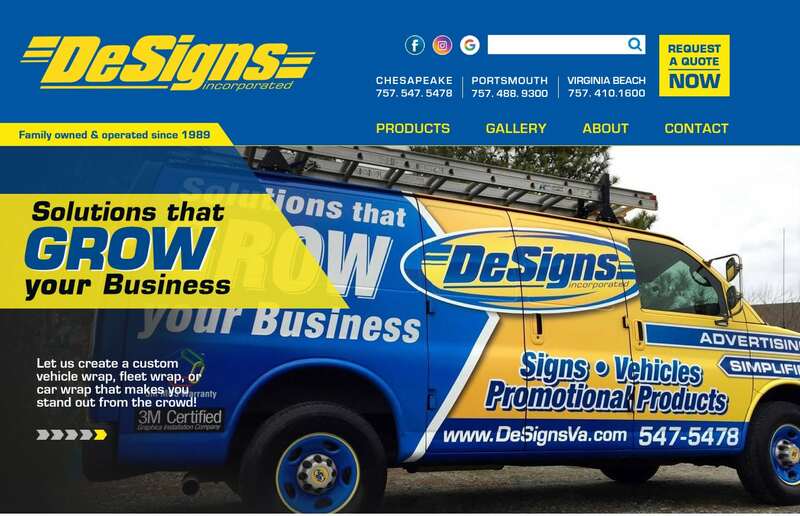 When it comes to ‘Website Design for Sign Companies’ – nobody does it better.